Columns: Select the column to the right of the columns you want to freeze. 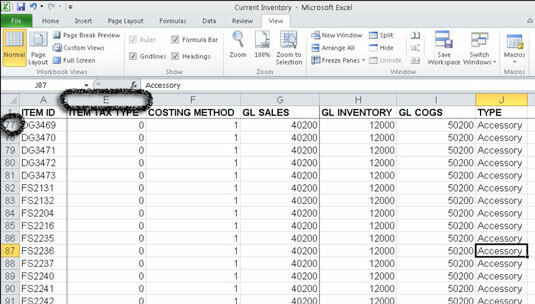 For example, click any cell in column B to freeze column A. Rows: Select the row below the rows you want to freeze. For example, click any cell in row 4 to freeze rows 1, 2, and 3. Columns and rows: Click the cell below the rows and to the right of the columns you want to freeze — essentially, the first cell that isn’t frozen. For example, click cell B2 to freeze both column A and row 1. Cells above and to the left of the current cell will be frozen. In the Window group of the View tab, choose Freeze Panes→Freeze Panes. A thin black line separates the sections. As you scroll down and to the right, notice that the columns above and rows to the left of the cell cursor remain fixed. Keep titles visible by freezing the panes. Normally when you press Ctrl+Home, Excel takes you to cell A1. However, when Freeze Panes is active, pressing Ctrl+Home takes you to the cell just below and to the right of the column headings. You can still use your arrow keys or click your mouse to access frozen cells. In the Window group of the View tab, choose Freeze Panes→Unfreeze Panes to unlock the fixed rows and columns. You can click the Freeze Top Row or Freeze First Column command in the Freeze Panes drop-down menu to freeze just the top row or first column in the worksheet, without regard to the position of the cell cursor in the worksheet. 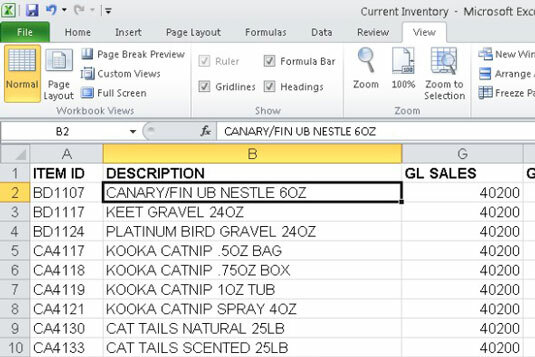 Did this glimpse into Excel workbooks leave you longing for more information and insight about Microsoft’s popular spreadsheet program? You’re free to test drive any of the For Dummies eLearning courses. Pick your course (you may be interested in more from Excel 2010), fill out a quick registration, and then give eLearning a spin with the Try It! button. You’ll be right on course for more trusted know how: The full version’s also available at Excel 2010.